"In the beginning God created beast and man so that both might live in friendship and share dominion over a world of peace. But in the fullness of time evil men betrayed God's trust and in disobedience to His holy word waged bloody wars, not only against their own kind, but against the apes, whom they reduced to slavery. Then God in his wrath sent the world a saviour, miraculously born of two apes who descended on Earth from Earth's own future and man was afraid, for both parent apes possessed the power of speech." The fifth and final film in the Planet of the Apes saga, Battle for the Planet of the Apes, has long been saddled with the title as "worst" entry of the series. Unfortunately, there are several solid reasons for this assessment. First and foremost among such reasons is the fact that Battle was made by 20th Century Fox for a pittance. It's a very low budget effort, and one that resolutely lacks the sense of scope and epic background that made the 1968 original such a landmark genre film. This is not a spectacular film in any sense of that word, and so disappointment is undeniably fostered. The Apes saga deserved, certainly, an ending befitting its imaginative, brilliantly-stylized beginning. Also, Battle features a controversial shift in creative authorship, from Paul Dehn to Joyce and John William Corrington, and apparently even its casting decisions bespeak of "the diminishing stature and budget of the series." Beyond these concerns, Battle for the Planet of the Apes is frequently edited in exceedingly sloppy fashion, particularly in the underwhelming climactic battle (in a tall tree, of all places...) between Caesar (Roddy McDowall) and his own simian Brutus, General Aldo (Claude Akins). There are several instances during this fight when a viewer can actually see that close-ups of both Aldo and Caesar from an earlier scene (a stand-off at the corral...) have been inserted. Without any difficulty, you can actually make-out the gorillas and other apes standing behind them, which doesn't make any sense in the context of the tree fight, high above the ground. But all the news is not bad. While it's undeniably true that Battle for the Planet of the Apes is not great film making by any standard, the sequel is nonetheless an eminently watchable and entertaining film, which is something that can't be said, for instance, of the 2001 Tim Burton re-imagination. And what Battle for the Planet of the Apes clearly lacks in budget, scope and editing, it largely makes up for in terms of intimacy, characterization, and even rhetorical flourish. This last quality is clearly the most significant. Battle for the Planet of the Apes has enough on its troubled mind for a full three entries in a science fiction franchise, and explores ably the idea of the ape culture's "fall from grace," as well as the possibility that one (dark...) future need not be written in stone. Also, the J. Lee Thompson film nicely squares the circle in terms of series continuity, bringing the final film right up to the beginning of the first film. Battle opens in 2670 AD. That's roughly the same time that Colonel Taylor (Charlton Heston) makes his recording from outer space in Planet of the Apes regarding the denizens of Earth. In that log entry, he wonders if he is speaking to a "new breed." With this film, we have our answer. The five-strong saga becomes, essentially, a loop or circle. Some years after the ape rebellion and a global nuclear war, the King of Ape City, Caesar (Roddy McDowall) struggles with civil rights in his metropolis. The humans there are second-class citizens, but some apes, including the treacherous General Aldo (Akins) would prefer to see them dead. When Caesar's human aide, MacDonald (Austin Stoker) informs the ape leader that the world is headed for disaster if the breach between humans and apes isn't repaired, Caesar asks for evidence of this assertion. MacDonald suggests that Caesar watch visual tapes of his own father, Cornelius, stored in the archives of the old city, which confirm his tale of Earth's destruction in 3955. With his scientific counsel, Virgil (Paul Williams) and MacDonald in tow, Caesar visit the old city, now flattened by a catastrophic nuclear exchange. Inside the radioactive city, the new governor, a "malformed" Kolp (Severn Darden) spies the interlopers, and attempts to capture them. After seeing the tapes of his own father, Caesar escapes with his friends from the City, but the damage is done. Kolp plans to launch an all-out war against Ape City. Upon his return home, Caesar makes preparations for war with the mutants, even as his beloved son, Cornelius (Bobby Porter) die following a fall from a high tree branch. Virgil and MacDonald suspect the death was no accident: that Aldo himself killed the boy. As writer Joyce Corrington has aptly described it, Battle for the Planet of the Apes is a story about the apes' expulsion from Paradise. Here, Ape City is a kind of agrarian Garden of Eden, and the apes, though intelligent, are also clearly innocent. The Serpent (in the deadly form of the firearm) is locked away and protected by Caesar's "conscience," an orangutan named Mandemus (real life pacifist Lew Ayres), and all the apes live by a sacred edict: Ape shall never kill ape. When Aldo violates that law, however the apes sacrifice their innocence. It's not merely the story of Cain and Abel revisited, it's that, as MacDonald states, the apes have finally "joined the human race." Notably, the treacherous Aldo's demise involves his fall from a great height, and therefore recalls, at least subtly, Lucifer's fall into the pit, even as it also directly references the death of young Cornelius. At one point, Caesar even tells Aldo that he is headed for a great fall, though the warning is ignored. Again, and again, Battle for the Planet of the Apes seems to grasp for connections to Biblical stories, and it's an interesting leitmotif, at least. After killing Aldo, Caesar asks Virgil if it is right that one murder should be avenged by another, getting at the fact that both man and ape are, at their core, violent creatures. This is another thematic through-line in the film, well expressed. The mutant Mendez, similarly, confronts Kolp over his war preparations and notes that "this bloody chain reaction has to stop." Kolp does not heed his advice. In fact, he's willing to destroy the world for his cause. In yet another instance, the film cuts to young Cornelius and a blond-haired human boy playing at "war" using sticks as makeshift guns. The game is innocent and harmless, and yet it begs the question: is there just something about the mammalian brain that is drawn to death and destruction? Why are even the best of us wired to play at these violent battles for supremacy? Is that the fatal flaw in man and ape? Years later, in Terminator 2: Judgment Day (1991), Cameron would stage a similar scene, using children playing at "war" to make the point. When Battle for the Planet of the Apes meditates on such interesting questions about human nature, the film works rather nicely, if modestly, as a morality play or parable. And I really admired the distinction the film draws between the apes and the humans in the destroyed city. Virgil explicitly notes that human "leaders" had the capability in their hands to destroy cities and whole populations, but that no one was there to mind their "conscience." Caesar, at least, has Mandemus to prevent him from acting impulsively, or in the role of a madman. This seems an entirely wise and prudent restriction on absolute power. The flattened city is a potent reminder of what happens when a leader does not consider those he leads, or the future of the planet. Battle for the Planet of the Apes gazes at these issues of innocence and self-destruction through the rubric of the "future." Specifically, can we make the future anything we wish? Virgil suggests that it is possible, and certainly, the last scene in the film, set in 2670 and a classroom for human and ape children, suggests as much. Importantly, the Lawgiver (John Huston) here is not the fire-and-brimstone, rabidly anti-human preacher of hatred that Ape Doctrine (the Sacred Scrolls) makes him out to be in Planet of the Apes. Rather, he seems to very actively preach peace between the species. He does so primarily, it seems, based on Caesar's modeling of that principle by releasing all the humans from the corral and inviting them to live in peace in Ape City as equals. For the first time in a Planet of the Apes film then, the audiences sees a statue of an ape that is not the Lawgiver. It is a statue of Caesar himself, indicating, perhaps, that the "peaceful" wise chimpanzee has usurped the role of the draconian Lawgiver in this timeline. We can extropolate then that it will be the teachings of peace and equality that march forward into the future of 3955, not the teachings of hatred and bigotry. Thus, when Taylor arrives to judge the world he finds in this timeline, he will find -- we hope -- two species living together in peace. If that's the case, he won't need to destroy the world with the Alpha-Omega Bomb. That's the hope that we leave the Planet of the Apes film series with. This time, it can be different. The valedictory visual of Battle for the Planet of the Apes series involves a close-up of the Caesar statue as it sheds a single tear. Perhaps Caesar cries because his dream of peace has finally been realized. His example has paved the way for the planet's eternal survival. Contrarily, Caesar's single tear may be interpreted to suggest that the future is ever unwritten; that war is still easier than peace; that hate is still easier to come by than love. It is, after all, a long way to 3955. Caesar weeps, perhaps, because human and ape natures remains unchanging, even if a temporary detente is forged. This reading of the film is supported by the imagery of an ape and human child teasing one another. Although some might consider this final visual of the series -- a crying statue -- a bit hokey, I admire it very much. I appreciate the fact that it is ambiguous enough to provoke debate and alternate readings. And also, the imagery provides a strong contrast to the Lawgiver statue we saw in Beneath crying blood. There, the draconian edicts of the Lawgiver created an environment of acrimony and hate and war, and the bleeding eyes suggested this very ably In Battle, the tears of Caesar are much more "human" somehow, a reflection of the fact that peace is a fragile and ephemeral thing. In the restored Blu-Ray cut of the film, Battle for the Planet of the Apes also reveals how the mutant survivors in the destroyed city ultimately select life over death. Though Kolp has ordered the launch of the Alpha Omega Bomb upon his defeat, Mendez (Paul Stevens) and Alma (Frances Nuyen) make a better choice. At Mendez's urging, the duo decides to "respect" and even "venerate" the bomb because one of its ancestors made them what they are. If the bomb were activated, Mendez argues, they would simply become "nothing." So this Adam and Eve choose life, after a fashion, and also begin to establish the mutant culture we see thriving in NYC in Beneath the Planet of the Apes (1970). Frankly, I love this bit of continuity with the earlier film, and it's a nice tying together of thematic, historical threads, though I always (perhaps erroneously) assumed Conquest took place in California, not New York. I'm glad this important scene was restored to the film. Another aspect of Battle for the Planet of the Apes that I enjoy involves the writing and presentation of the character, Kolp. He's not your average villain, and comes off as strangely quirky. Take his line, "we're irradiated, but we're still active," which should be the slogan, I submit, for all big screen mutants. Kolp actually seems to launch the war against Ape City more because of his own personal boredom rather than because of any strong ideological bent. It's almost like he's offended that Caesar didn't drop by to chat with him. Again, if the movie as a whole concerns the idea of advisers keeping their leader's conscience in times of conflict, Kolp is the perfect example of what happens when that safeguard doesn't occur (or when it is ignored). He is willing to destroy the world just because, it seems, he has nothing better to do. 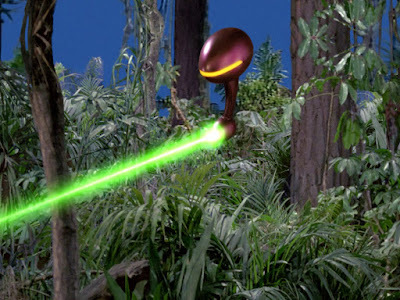 The mutant vs. ape battle featured in the film is pitifully small scale, but in some ways, the meager forces involved in the conflict also play directly to the movie's thematic point. There's hardly anybody left alive on the planet, and now it's come to this: about a dozen mutants carrying rifles, following a school bus, a station wagon and a jeep through an irradiated desert. Kind of a sad commentary on humanity. Even with his world almost entirely destroyed, all man can think about is wreaking more destruction and death. In one great shot during this mutant march, the audience can actually see one of the mutant soldiers collapse and fall to the ground. These guys are sick...and they're all that's left. I enjoy that desperate aesthetic, and some of the picturesque shots of the small-time, automobile caravan moving across the desert definitely appear to forecast the direction of post-apocalyptic cinema in the 1980s. Battle for the Planet of the Apes also works for me, I suppose, because I genuinely like the well-delineated characters featured in the film. Caesar, of course, is a great hero, and he loses a beloved child in a scene that plays as genuinely sad. He's a wise ape, but not an infallible one. He's constantly questioning and groping for the right solution to problems. He's a strong leader. MacDonald, Virgil, Mandemus, Abe, and Lisa also come across as more than cookie-cutter characters. In short, they seem like real people/apes, and are interesting enough to follow, even if the film doesn't provide them an epic tapestry upon which to act. Even Aldo -- who, like Kolp could be a very two-dimensional monster -- seems to boast deeper layers thatn you might expect. When he is branded for breaking ape law, and cowers in the tree, for instance, you can see that he is weeping. Aldo cries for all that he has brought upon himself; for all that he has lost, and will lose next. Again, a more conventional and less interesting approach would have seen him continuing to be a "strong" bad guy and posing a more potent physical challenge to Caesar. I hate to keep bludgeoning the 2001 re-imagination, but none of the characters there boast anything other than stereotypical movie "motivations." For all of Battle's flaws, that's not true here. The characters ring true. Many viewers may count it as a drawback, but the fact of the matter is that there are no "strong" bad guys in Battle for the Planet of the Apes, and I submit that's sort of the film's point. You end up feeling a little sorry for both Kolp and Aldo by film's end. Through their quirks and humanity (or ape-manity) we can actually see that they are people too. If Battle for the Planet of the Apes is about ending conflict, hatred and blood-shed, then it makes sense that both these characters resonate in terms of their individuality. It allows us to understand these "villains" rather than simply demonize them. I suppose Battle for the Planet of the Apes is nobody's favorite "ape" movie, and I understand the reasons why all too plainly. It seems sloppy and like small potatoes compared to Planet, or Conquest. It lacks the pointed social commentary and sharp humor of Escape and the balls-to-the-wall, go-for-broke, searing surprises of Beneath. Yet on its own small, almost TV-sized scale, Battle for the Planet of the Apes is an enjoyable and worthwhile effort. I think it is probably a lot better than the film's reputation indicates. As Virgil might remind us, Battle for the Planet of the Apes -- even with its lack of significant production value -- "reverts to type," and offers the thinking viewer much to ponder. It asks us, specifically, if our desire for peace can ever overcome our penchant for self-destruction. For an answer to that question, take a look at Caesar's statue and arrive at your own conclusion.